TVPD’s Isuzu Super Truck has a New Look! 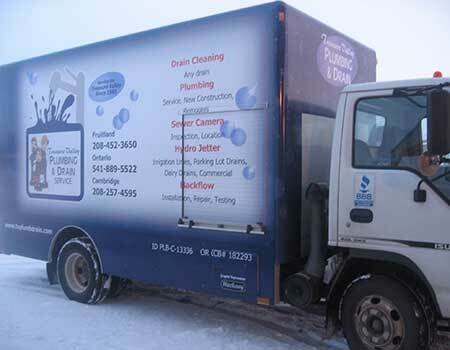 We designed a new vehicle wrap to coordinate with our website and brochures, so our service vehicles would be more recognizable to our customers in the Treasure Valley. You will find out trucks from McCall to Cambridge, through Weiser to Homedale, Caldwell to Payette, and all over Malheur County, Oregon. We added some bubbles, and if you look real close at our logo, you’ll see that one of the guys has changed. We’re very excited to have this new look and a second Super Truck to better serve the plumbing and drain cleaning needs of the great people of the Treasure Valley of Idaho and Oregon. This Super Truck is equipped with Sewer Cameras, Drain Cleaning machines, Plumbing parts and supplies, and a Hydro-Jetter with high pressure water jets to clean irrigation, Dairy, and Industrial waste lines up to 10″ in diameter. Chad and Chase are the Service Techs on this truck with the experience and expertise to solve any Plumbing and Drain Cleaning issues you might have, in a timely and professional manner.